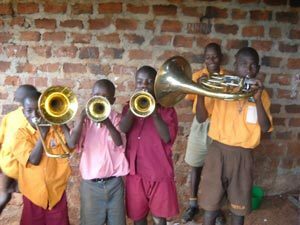 The school they will be visiting has a brass band, conductor and teacher. They are in need of playable instruments. If any one has any unused, playable instruments in their attic or closet such as trumpets, horns (French, British, German), bugles, clarinets and flutes, donations would be appreciated. Instruments can be dropped off in the office by Friday May, 18th. The group going will be meeting to pack the supplies for the orphanage in a few weeks. Each is allowed to bring up to 150 lbs. Instruments need to be into the Church by Friday, May 18th so they can be packed up.